How proteins fold from linear chains of amino acids to delicate three-dimensional structures remains a fundamental biological problem. Single-molecule manipulation based on high-resolution optical tweezers (OT) provides a powerful approach to study protein folding with unprecedented spatiotemporal resolution. In this method, a single protein or protein complex is tethered between two beads confined in optical traps and pulled. Protein unfolding induced by the mechanical force is counteracted by the spontaneous folding of the protein, reaching a dynamic equilibrium at a characteristic force and rate. The transition is monitored by the accompanying extension change of the protein and used to derive conformations and energies of folding intermediates and their associated transition kinetics. 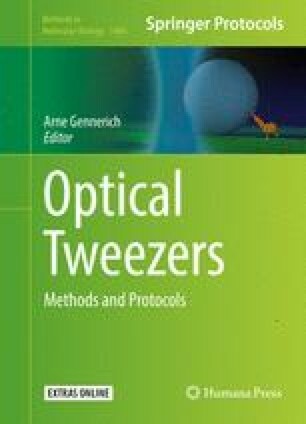 Here, we provide general strategies and detailed protocols to study folding of proteins and protein complexes using optical tweezers, including sample preparation, DNA-protein conjugation and methods of data analysis to extract folding energies and rates from the single-molecule measurements.